Carl, my thought was that he was showing a possible route through the Cilician Gates which Paul did not take on the return. But the Cilician Gates are a long way from Antioch. Another problem is the location of Attalia and Perga. It is a cute idea. I especially like the “Good Barber” at Cenchreae. Linda, you should get a good Bible atlas like the Zondervan Bible Atlas of the Bible, or the Essential Atlas of the Bible which would be easier to take to Bible class. See https://ferrelljenkins.wordpress.com/2013/12/11/zondervan-essential-atlas-of-the-bible/. 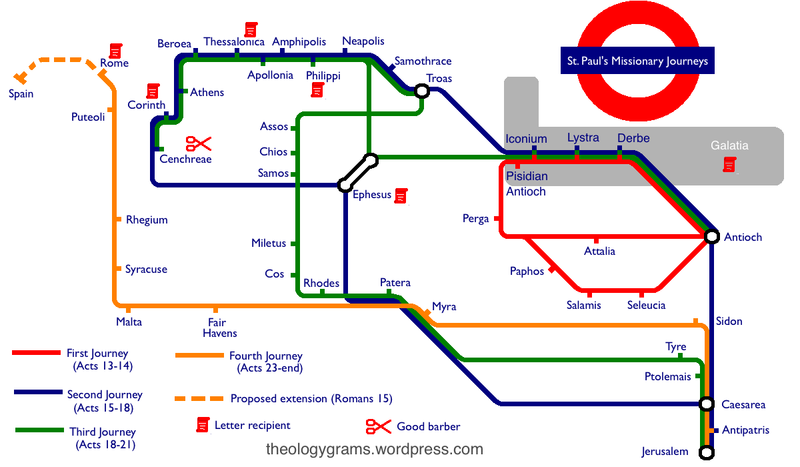 I never could read a London “Tube Map”—but I wonder why there is a connection between Derbe and Antioch on Paul’s first journey. Seems much easier to follow than the little maps in the back of most Bibles. Helpful teaching tool.